If you care about federal deficits,* then, of course, the Republican Party is the last one you want to trust with the budget. Those of us with a capacity for memory better than that of goldfish may remember the simplest confirming instance: Bill Clinton raised taxes, created a surplus, and famously presided over peace and prosperity. George W. Bush (remember him ?– Mitt Romney doesn’t)…not so much. But now, we are told, we have the new improved Republican Party, in which the very serious man of numbers and ideas, Paul Ryan, will lead us to fiscal sanity and the promised budgetary land of liberty-induced-prosperity. How, then, does Ryan get to call himself a fiscal hawk? By asserting that he will keep his tax cuts revenue-neutral by broadening the base in ways he refuses to specify, and that he will make further large cuts in spending, in ways he refuses to specify. And this is what passes inside the Beltway for serious thinking and a serious commitment to deficit reduction. The Republican Party is not simply a bunch of kleptomaniac sociopaths; they really will gut the Untied States of America. They are the party of decline and fall. For Romney, read Romulus Augustulus. 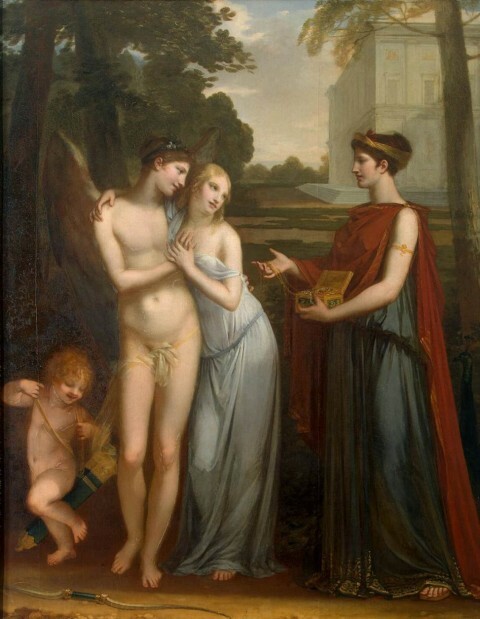 Image: Pierre-Paul Prud’hon, Innocence Preferring Love To Wealth, 1804.